Are Olympic missiles just for show? Anti-aircraft missiles are being stationed in London to protect the Olympics from aircraft used in a terror attack. But could they actually be used? And what are the risks if they are fired? 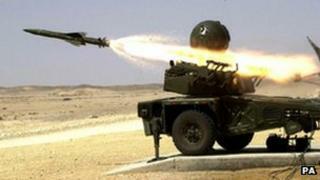 Six sites are being used to site surface-to-air missiles to guard the 2012 Games. The missiles will be a mix of Rapiers - used in the Falklands conflict 30 years ago - and the Starstreak high velocity missile (HVM), which has a shorter range but is faster. Their location in built-up areas has worried some, especially residents of the Fred Wigg Tower in Waltham Forest, north London, who took the Ministry of Defence (MoD) to court to try - unsuccessfully - and remove HVM missiles from their roof . While the MoD has said there is no specific threat to the Games, the missile deployment follows similar measures taken at the Beijing Games in 2008 and the Athens Olympics in 2004. Last month, Defence Secretary Philip Hammond announced a restricted fly zone around the Olympic Park, coming into effect on 14 July . The sight of Rapier missile launchers in placid parkland is a reminder of how security-conscious the modern Olympics have had to become. Placing Ground Based Air Defence systems on top of residential building was always going to be controversial. But the MoD insists they are an essential element of a "layered" air defence security bubble around the main Olympics site. The reality is that they're unlikely to be used - they're more a "show of force" designed to reassure and deter. Typhoon jets, based at RAF Northolt, and helicopters carrying snipers on board would be activated long before a suspicious aircraft could get anywhere near east London. The Rapier missile batteries, and the Starstreak High Velocity Missiles are the very last line of defence. There will be relief in the MoD that they've won this case at the High Court. There was no Plan B to locate the missiles elsewhere. "This is the first time we have seen ground-to-air missiles used in this way in the UK," said Ben Goodlad, a senior analyst at IHS Jane's, adding that "their deployment cannot be seen as purely for show". "Planners have looked carefully at the capabilities required to counter particular scenarios, no matter how unlikely they may be. The sites chosen for Rapier and HVM systems have been carefully selected with this role in mind." The MoD said before Tuesday's court decision: "We maintain that ground-based air defence on Fred Wigg Tower is an essential part of the multi-layered air security plan and we will continue to press for its deployment there." Dr Tobias Feakin of the Royal United Services Institute for Defence and Security Studies (RUSI) said showing off such capability is a standard military response. "The military have put them [missile launchers] on TV as it's the military deterrence theory that you show your capability to your adversary, because they then realise the magnitude of the capability they are dealing with." Last week the MoD released a statement about their security plans, after an exercise in May using unarmed missile launchers to test their preparedness. "Collectively, the systems include a range of air defence capabilities, including radar and detection equipment as well as weapons, which will provide a powerful deterrent and protection against the threat of an attack from the air." BBC defence correspondent Jonathan Beale said: "This is as much about reassuring allies and competing nations - not least the US." The missiles would back up a detachment of four Typhoon fighter aircraft which will patrol the skies and, if need be, shoot down any suspicious aircraft. Sniper teams in helicopters will be on standby to deal with slower targets such as microlights. Dr Feakin described the missile systems as "absolutely the last resort". It is believed Prime Minister David Cameron would ultimately be responsible for any decision to shoot down an aircraft using Ground Based Air Defences (GBAD). The MoD said: "Nobody has ever suggested that the use of GBAD would not have implications on the ground but the point is that these systems are proposed as an absolute last resort option, as part of a much broader, layered air security plan aimed at protecting all of those involved in the Olympics, including local residents." But shooting down a 'suicide aircraft' - whether that be a light aircraft or a hijacked airliner - is very different to shooting down a military plane over a battlefield. "The risk of using one of these systems is that any aircraft shot down will cause collateral damage to residential areas surrounding the Olympic stadium," says Mr Goodlad. "However this should be balanced against the potential consequences of not shooting down a potential threat, such as an aircraft crashing into the 80,000-capacity stadium." While no air force has yet had to shoot down a hijacked airliner, there have been incidents where defences have been tested by unidentified aircraft. In July 1989, a Soviet MiG-23 took off from Poland on a routine training flight - soon after, the engine failed and the pilot ejected. The pilotless MiG, however, recovered from engine problems, and flew through western Poland, East Germany - and over the Cold War border into West Germany. A pair of US fighter planes was scrambled to deal with it, but even after identifying that the aircraft was pilotless, could not shoot it down because it was travelling over built-up areas. The pair then planned to deal with it over water, but the MiG ran out of fuel and crashed into a Belgian farmhouse, killing a teenage boy. Dr Feakin believes the fact the MoD was taken to court by unhappy residents claiming a lack of consultation is an unfortunate lapse. "The public communications side of this is something that could be learned from. This is an urban environment which traditionally doesn't have the military deployed there. "I think the military will do a fantastic job - they already do a great job assisting at events like Wimbledon, or in my own experience at the London Triathlon. But the [public] communication should have been done a little better." He added, however, that other methods would be used to foil any plot to disrupt the Games. "Through the 2000s our security agencies have learned a great deal not just about the threat, but how to counter it. Not just MI5 and MI6, but our counter-terrorist policing too." If there is a serious plot to attack the Games from the air, he said, the aim would be to deal with it long before it ever reaches an airport.